All-Ireland holders Tyrone will face Monaghan in the final of the 2016 Ulster Under-21 Football Championship. In Wednesday's semi-finals, Tyrone came from two points down at half-time to beat Donegal 1-15 to 2-8 while Monaghan were 2-16 to 0-9 winners over Armagh. Tyrone led 1-6 to 0-6 in the second half after a Ryan Coleman goal but Conor Doherty netted for Donegal. The young Red Hands then built up a big lead and a late Stephen McBrearty penalty could not save Donegal. At Pairc Esler in Newry, substitutes Fearghal McMahon and Francis Maguire netted in the second half to put Monaghan through to the decider for the first time in nine years. Monaghan landed five points in a row in the 10 minutes before half time to establish a 0-9 to 0-6 lead at the break. They then hit 1-5 without reply in the second half to take the game away from Armagh. Monaghan got a penalty for an innocuous foul off the ball after Conor McCarthy's free dropped short and was punched clear by the 'keeper. McMahon converted and goalkeeper Conor Forde also nailed a couple of long-range placed balls. 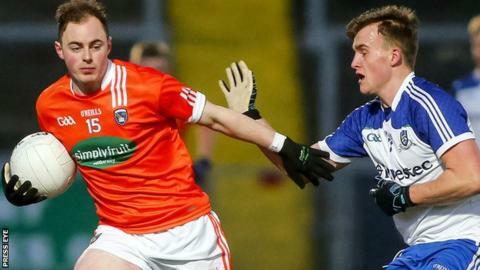 Oisin O'Neill ended a 22-minute scoring drought for Armagh, who managed just three points in the second half. Maguire capitalised on a defensive lapse to tap home a loose ball and round off an easy victory. The final is to be played on Wednesday, 6 April.